Our journalism course is designed to enable you to train and develop as a practitioner so that you will be the ones to report tomorrow’s news. If you want to become a journalist and explore what journalism is and where it is heading, this is the perfect course for you. 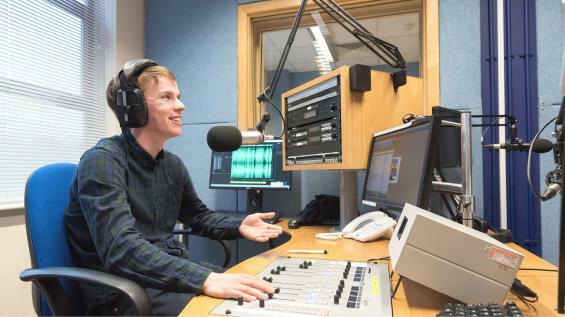 Delivered at the state-of-the-art Media and Journalism Centre in the heart of the city and at the University Centre main campus, you will learn under the guidance of current industry professionals and be given a practical grounding in print, radio, photo and online journalism. You will learn how to produce imaginative and incisive copy to deadline and as well as developing a range of skills to ensure you have the creativity and versatility to thrive in today’s industry. You’ll look at the problems, pitfalls and potential for today’s journalism, studying its past and debating its future. If your interest is sport or fashion journalism we will support you in this allowing you to specialise throughout the course. During your time with us you will have the opportunity to work with local and regional partners in Peterborough and undertake exciting paid internships with local businesses and placements at major consumer magazine titles. You will also have the opportunity to learn from professional journalists and media professionals in our guest speaker events organised by students and staff. Take cutting edge industry modules like Mobile Journalist. Learn from industry professionals in city that hosts media giants like BGL and Bauer Media. The Professional Practice module in year 3 enables students to undertake commissions and work placements and build a portfolio of work which can secure their first job. The ability to specialise in an area of particular interest like fashion or sport. I am the Course Leader for the BA (Hons) Journalism degree at University Centre Peterborough. My teaching in journalism at University Centre Peterborough began in September 2012, with the majority of modules taught focusing on the more practical and modern elements of the course; for example, modules that link core journalistic values and practices with elements of digital publishing. Prior to teaching, I worked mostly in local news; starting at the Fenland Citizen, before moving to the Peterborough Telegraph - then a daily publication prior to its shift to a weekly format. However, my final full-time journalistic role was as the Deputy Editor for a specialist education title, FE Week, during its launch and initial year of growth. After a short stint at a public relations and community engagement firm I started my work at University Centre Peterborough, which I now combine with a sports journalism freelance career, focusing mostly on football reporting; feature writing and match day work. During my MA, for which I graduated with a Distinction grade in September 2017, my research centred on the emergence of social media and its links to social media. This included a research project for my dissertation that studied the practices used by sports journalists on social media and the abuse that those journalists suffer on social media, which is work I intend to continue.